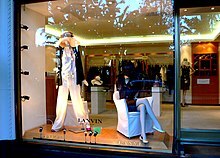 Retail comes from the Old French word tailler, which means "to cut off, clip, pare, divide" in terms of tailoring (1365). It was first recorded as a noun with the meaning of a "sale in small quantities" in 1433 (from the Middle French retail, "piece cut off, shred, scrap, paring"). As in the French, the word, retail, in both Dutch and German, also refers to the sale of small quantities of items. Retailing often occurs in retail stores or service establishments, but may also occur through direct selling such as through vending machines, door-to-door sales or electronic channels. Although the idea of retail is often associated with the purchase of goods, the term may be applied to service-providers that sell to consumers. Retail service providers include retail banking, tourism, insurance, private healthcare, private education, private security firms, legal firms, publishers, public transport and others. For example, a tourism provider might have a retail division that books travel and accommodation for consumers plus a wholesale division that purchases blocks of accommodation, hospitality, transport and sightseeing which are subsequently packaged into a holiday tour for sale to retail travel agents. In the more populous cities, a small number of shops were beginning to emerge by the 13th century. In Chester, a medieval covered shopping arcade represented a major innovation that attracted shoppers from many miles around. Known as " The Rows" this medieval shopping arcade is believed to be the first of its kind in Europe. Fragments of Chester's Medieval Row, which is believed to date to the mid-13th century, can still be found in Cheshire. In the 13th or 14th century, another arcade with several shops was recorded at Drapery Row in Winchester. The emergence of street names such as Drapery Row, Mercer's Lane and Ironmonger Lane in the medieval period suggests that permanent shops were becoming more commonplace. The Palais-Royal, which opened to Parisians in 1784 and became one of the most important marketplaces in Paris, is generally regarded as the earliest example in the grand shopping arcades. The Palais-Royal was a complex of gardens, shops and entertainment venues situated on the external perimeter of the grounds, under the original colonnades. The area boasted some 145 boutiques, cafés, salons, hair salons, bookshops, museums, and numerous refreshment kiosks as well as two theatres. The retail outlets specialised in luxury goods such as fine jewellery, furs, paintings and furniture designed to appeal to the wealthy elite. Retailers operating out of the Palais complex were among the first in Europe to abandon the system of bartering, and adopt fixed-prices thereby sparing their clientele the hassle of bartering. Stores were fitted with long glass exterior windows which allowed the emerging middle-classes to window shop and indulge in fantasies, even when they may not have been able to afford the high retail prices. Thus, the Palais-Royal became one of the first examples of a new style of shopping arcade, frequented by both the aristocracy and the middle classes. It developed a reputation as being a site of sophisticated conversation, revolving around the salons, cafés, and bookshops, but also became a place frequented by off-duty soldiers and was a favourite haunt of prostitutes, many of whom rented apartments in the building. London's Burlington Arcade, which opened in 1819, positioned itself as an elegant and exclusive venue from the outset. Other notable nineteenth century grand arcades include the Galeries Royales Saint-Hubert in Brussels which was inaugurated in 1847, Istanbul's Çiçek Pasajı opened in 1870 and Milan's Galleria Vittorio Emanuele II first opened in 1877. Shopping arcades were the precursor to the modern shopping mall. Retail, using mail order, came of age during the mid-19th century. 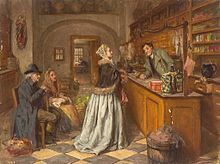 Although catalogue sales had been used since the 15th century, this method of retailing was confined to a few industries such as the sale of books and seeds. However, improvements in transport and postal services, led several entrepreneurs on either side of the Atlantic to experiment with catalogue sales. In 1861, Welsh draper Pryce Pryce-Jones sent catalogues to clients who could place orders for flannel clothing which was then despatched by post. This enabled Pryce-Jones to extend his client base across Europe. A decade later, the US retailer, Montgomery Ward also devised a catalogue sales and mail-order system. His first catalogue which was issued in August 1872 consisted of an 8 in × 12 in (20 cm × 30 cm) single-sheet price list, listing 163 items for sale with ordering instructions for which Ward had written the copy. He also devised the catch-phrase "satisfaction guaranteed or your money back" which was implemented in 1875. By the 1890s, Sears and Roebuck were also using mail order with great success. As the 21st century takes shape, some indications suggest that large retail stores have come under increasing pressure from online sales models and that reductions in store size are evident. Under such competition and other issues such as business debt,  there has been a noted business disruption called the retail apocalypse in recent years which several retail businesses, especially in North America, are sharply reducing their number of stores, or going out of business entirely. Perspective of large retail enterprises of supply chain relationship marketing is based on the theory of supply chain management in large retail enterprises of supply chain in the application of relationship marketing, it emphasizes that the suppliers, large-scale retail enterprises, customers form a chain of large retail enterprises and suppliers to form cooperative marketing, establish mutually beneficial long term good relationship with customers.Relationship marketing of huge retail enterprises from the perspective of supply chain mainly includes two relationship markets, supplier relationship and customer relationship market.Because the two stakeholders that have the greatest influence on the profits of retail enterprises are suppliers and customers.First, as the supplier of commodities to retail enterprises, it directly determines the procurement cost of commodities to retail enterprises, which is mainly reflected in the purchase price of commodities themselves, the cost incurred in the procurement process, and the loss cost caused by unstable supply of commodities.In addition, the good relationship with supplier interaction, large retail enterprises can also promote the suppliers timely grasp the market information, improved or innovative products according to customer demand, which contributed to the retail enterprises improve the market competitiveness of the goods are sold, so the retail enterprise's relationship with supplier directly affects the retail enterprises in the commodity market competitive.Second, due to the transfer of advantages between buyers and sellers, the retail industry has turned to the buyer's market, and consumers have become the key resources for major retailers to compete with each other. Therefore, it is very important to establish a good relationship with clients and improve customer loyalty. The relationship marketing of customer relationship market regards the transaction with clients as a long term activity.Retail enterprises should pursue long-term mutual benefit maximization rather than a single transaction sales profit maximization.This requires large retail enterprises to establish a customer-oriented trading relationship with the customer relationship market. Retail stores are typically located where market opportunities are optimal – high traffic areas, central business districts. Selecting the right site can be a major success factor. When evaluating potential sites, retailers often carry out a trade area analysis; a detailed analysis designed to approximate the potential patronage area. Techniques used in trade area analysis include: Radial (ring) studies; Gravity models and Drive time analyses. A major retail trend has been the shift to multi-channel retailing. To counter the disruption caused by online retail, many bricks and mortar retailers have entered the online retail space, by setting up online catalogue sales and e-commerce websites. However, many retailers have noticed that consumers behave differently when shopping online. For instance, in terms of choice of online platform, shoppers tend to choose the online site of their preferred retailer initially, but as they gain more experience in online shopping, they become less loyal and more likely to switch to other retail sites. Online stores are usually available 24 hours a day, and many consumers in Western countries have Internet access both at work and at home. Price bundling (also known as product bundling) occurs where two or more products or services are priced as a package with a single price. There are several types of bundles: pure bundles where the goods can only be purchased as package or mixed bundles where the goods can be purchased individually or as a package. The prices of the bundle is typically less than when the two items are purchased separately. Price bundling is extensively used in the personal care sector to prices cosmetics and skincare. Sales staff must learn to recognise when the customer is ready to make a purchase. If the sales person feels that the customer is ready, then they may seek to gain commitment and close the sale. Experienced sales staff soon learn to recognise specific verbal and non-verbal cues that signal the client's readiness to buy. For instance, if a customer begins to handle the merchandise, this may indicate a state of buyer interest. Clients also tend to employ different types of questions throughout the sales process. General questions such as, "Does it come in any other colours (or styles)?" indicate only a moderate level of interest. However, when clients begin to ask specific questions, such as "Do you have this model in black?" then this often indicates that the prospect is approaching readiness to buy. When the sales person believes that the prospective buyer is ready to make the purchase, a trial close might be used to test the waters. A trial close is simply any attempt to confirm the buyer's interest in finalising the sale. An example of a trial close, is "Would you be requiring our team to install the unit for you?" or "Would you be available to take delivery next Thursday?" If the sales person is unsure about the prospect's readiness to buy, they might consider using a 'trial close.' The salesperson can use several different techniques to close the sale; including the ‘alternative close’, the ‘assumptive close’, the ‘summary close’, or the ‘special-offer close’, among others. The environment in which the retail service encounter occurs is sometimes known as the retail servicescape. 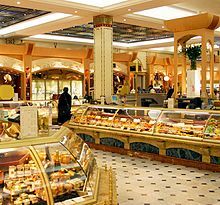 The store environment consists of many elements such as smells, the physical environment (furnishings, layout and functionality), ambient conditions (lighting, temperature, noise) as well as signs, symbols and artifacts (e.g. sales promotions, shelf space, sample stations, visual communications). Collectively, these elements contribute to the perceived retail servicescape or the overall atmosphere and can influence both the customer's cognitions, emotions and their behaviour within the retail space. Relationship between market Large retail enterprises of relationship marketing refers to a large retail enterprise with suppliers, customers, internal organization, channel distributors, market impact, and other competitors such as the interests of the enterprise marketing process related everything to establish and maintain good relations, thus maximizing the interests of the large retail enterprise in the long-term marketing activities, it was based on the relationship marketing concept as the core of innovation.Different from traditional marketing concepts, relationship marketing focuses on maintaining long-term good relations with relevant parties on marketing activities. The ultimate goal of relationship marketing is tantamount to maximize the long term interests of enterprises. The marketing activities of large retail enterprises mainly have six relationship markets, which are supplier relationship market, customer relationship market, enterprise internal relationship market, intermediary relationship market at all levels, enterprise marketing activities influence relationship market and industry competitor relationship market.Among these six relational markets, supply relational market and customer relational market are the two markets that have the greatest influence on the relationship marketing of large retail enterprises.Substantial retail enterprises usually have two sources of profit. The principal source of profit is to reduce the purchase price from suppliers. The other is to develop new customers and keep old clients, so as to expand the market sales of goods.In addition, the extra four related markets have an indirect impact on the marketing activities of large retail enterprises. The internal relationship market of an enterprise can be divided into several different types of relationships according to distinct objects, such as employee relationship market, department relationship market, shareholder relationship market and the mutual relations among the relationship markets. The purpose of carrying out relationship marketing is to promote the cohesion and innovation ability of enterprises and maximize the long term interests of enterprises. Another relationship of relationship marketing middlemen is the relationship between market and intermediary in the process of corporate marketing is playing the intermediary role between suppliers and customers, in the current increasingly fierce market competition, more important distribution channels for enterprises, but for retail enterprises, too much sales levels will increase the cost of sales of the enterprise. Therefore, large retail enterprises should realize the simplification of sales channel level by reasonably selecting suppliers.Large-scale retail enterprises purchasing goods to suppliers with procurement scale advantage, can directly contact with the product manufacturing, with strong bargaining power, therefore, direct contact with the manufacturer is a large retail enterprise to take the main purchasing mode, it is a terminal to the starting point of zero level channel purchasing mode, therefore, the elimination of middlemen, so as to make the large retail enterprise in the marketing activity, the dealer relationship market is not so important.Then there is the enterprise influence relationship market, which is a relational marketing influence in the enterprise supply chain. It mainly guides and standardizes the advance direction of enterprises through formulating systems at the macro level.The relationship market mainly includes the relationship between the relevant government departments at all levels where the enterprise is located, the relationship with the industry association to which the enterprise belongs, and the relationship with all kinds of public organizations, etc., and the enterprise influence itself cannot directly affect the marketing activities of the enterprise.The final relational market is the industry's competitors, potential competitors, alternative competitors and so on.How to correctly deal with the relationship between competitors and the market has become a problem that large retail enterprises need to solve. The way that brands are displayed is also part of the overall retail design. 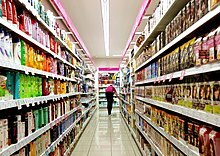 Where a product is placed on the shelves has implications for purchase likelihood as a result of visibility and access. Products placed too high or too low on the shelves may not turn over as quickly as those placed at eye level. With respect to access, store designers are increasingly giving consideration to access for disabled and elderly customers. Through sensory stimulation retailers can engage maximum emotional impact between a brand and its consumers by relating to both profiles; the goal and experience. Purchasing behaviour can be influenced through the physical evidence detected by the senses of touch, smell, sight, taste and sound. Supermarkets offer taste testers to heighten the sensory experience of brands. Coffee shops allow the aroma of coffee to waft into streets so that passers-by can appreciate the smell and perhaps be lured inside. Clothing garments are placed at arms' reach, allowing customers to feel the different textures of clothing. Retailers understand that when customers interact with products or handle the merchandise, they are more likely to make a purchase. Ambient conditions, such as lighting, temperature and music, are also part of the overall retail environment. It is common for a retail store to play music that relates to their target market. Studies have found that "positively valenced music will stimulate more thoughts and feeling than negatively valenced music", hence, positively valenced music will make the waiting time feel longer to the customer than negatively valenced music. In a retail store, for example, changing the background music to a quicker tempo may influence the consumer to move through the space at a quicker pace, thereby improving traffic flow. Evidence also suggests that playing music reduces the negative effects of waiting since it serves as a distraction. Jewellery stores like Michael Hill have dim lighting with a view to fostering a sense of intimacy. Some researchers have adapted Sproles and Kendall's methodology for use in specific countries or cultural groups. Consumer decision styles are important for retailers and marketers because they describe behaviours that are relatively stable over time and for this reason, they are useful for market segmentation. Retailers selling consumer durables are sometimes known as hardline retailers  – automobiles, appliances, electronics, furniture, sporting goods, lumber, etc., and parts for them. Goods that do not quickly wear out and provide utility over time. For the consumer, these items often represent major purchase decisions. Consumers purchase durables over longer purchase decision cycles. For instance, the typical consumer might replace their family car every 5 years, and their home computer every 4 years. The term, ' bazaar' can have multiple meanings. It may refer to a Middle-Eastern market place while a 'penny bazaar' refers to a retail outlet that specialises in inexpensive or discounted merchandise. In the United States a bazaar can mean a "rummage sale" which describes a charity fundraising event held by a church or other community organization and in which either donated used goods are made available for sale. By supplying a wide assortment in a single category for lower prices a category killer retailer can "kill" that category for other retailers. A category killer is a specialist store that dominates a given category. Toys "R" Us, established in 1957, is thought to be the first category killer, dominating the children's toys and games market. For a few categories, such as electronics, home hardware, office supplies and children's toys, the products are displayed at the centre of the store and a sales person will be available to address customer queries and give suggestions when required. Rival retail stores are forced to reduce their prices if a category killer enters the market in a given geographic area. Examples of category killers include Toys "R" Us and Australia's Bunnings (hardware, DIY and outdoor supplies) and Officeworks (stationery and supplies for the home office and small office). Some category killers redefine the category. For example, Australia's Bunnings began as a hardware outlet, but now supplies a broad range of goods for the home handyman or small tradesman, including kitchen cabinetry, craft supplies, gardening needs and outdoor furniture. 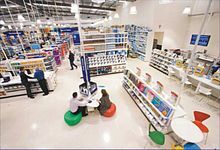 Similarly Officeworks straddles the boundary between stationery supplies, office furniture and digital communications devices in its quest to provide for all the needs of the retail consumer and the small, home office. Chain store is one of a series of stores owned by the same company and selling the same or similar merchandise. Chain stores aim to benefit from volume buying discounts (economies of scale) and achieve cost savings through economies of scope (e.g. centralised warehousing, marketing, promotion and administration) and pass on the cost savings in the form of lower prices. Concept stores are similar to speciality stores in that they are very small in size, and only stock a limited range of brands or a single brand. They are typically operated by the brand that controls them. Example: L'OCCITANE en Provence. The limited size and offering of L'OCCITANE's stores is too small to be considered a speciality store. However, a concept store goes beyond merely selling products, and instead offers an immersive customer experience built around the way that a brand fits with the customer's lifestyle. 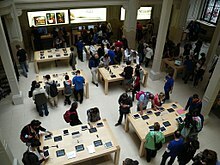 Examples include Apple's concept stores, Kit Kat's concept store in Japan. Hawkers also known as a peddlers, costermongers or street vendors; refer to a vendor of merchandise that is readily portable. Hawkers typically operate in public places such as streets, squares, public parks or gardens or near the entrances of high traffic venues such as zoos, music and entertainment venues, but may also call on homes for door-to-door seling. Hawkers are a relatively common sight across Asia. A high street store is a term used widely in the United Kingdom where more than 5,000 High Streets where a variety of stores congregate along a main road. Stores situated in the High Street provide for the needs of a local community, and often give a locality a unique identity. A mall has a range of retail shops at a single building or outlet, arranged on a single level or multiple levels. A shopping mall typically includes one or more anchor stores. The retail mix in a mall may include outlets such as food and entertainment, grocery, electronics, furniture, gifts and fashion. Malls provide 7% of retail revenue in India, 10% in Vietnam, 25% in China, 28% in Indonesia, 39% in the Philippines, and 45% in Thailand. Malls are typically managed by a central management/ marketing authority which ensures that the mall attracts the right type of retailer and an appropriate retail mix. A supermarket is a self-service store consisting mainly of grocery and limited products on non-food items. They may adopt a Hi-Lo or an EDLP strategy for pricing. The supermarkets can be anywhere between 20,000 square feet (1,900 m2) and 40,000 square feet (3,700 m2). Example: SPAR supermarket. Pawnbrokers Another form is the pawnshop, in which goods are sold that were used as collateral for loans. There are also " consignment" shops, which are where a person can place an item in a store and if it sells, the person gives the shop owner a percentage of the sale price. 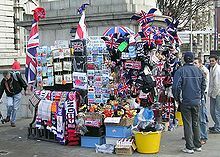 The advantage of selling an item this way is that the established shop gives the item exposure to more potential buyers. E-tailers like OLX and Quikr also offer second-hand goods. ^ a b Hoch, Steven J.; Drèze, Xavier; Purk, Mary E. (October 1994). "EDLP, Hi-Lo, and Margin Arithmetic" (PDF). The Journal of Marketing. 58 (4): 16–27. doi: 10.1177/002224299405800402. ^ Livesay, F. (1976). "Promotional Pricing". Pricing. Macmillan. pp. 77–82. doi: 10.1007/978-1-349-15651-1_7. ISBN 978-1-349-15651-1. ^ a b Hul, Michael K.; Dube, Laurette; Chebat, Jean-Charles (1 March 1997). "The impact of music on consumers' reactions to waiting for services". Journal of Retailing. 73 (1): 87–104. doi: 10.1016/S0022-4359(97)90016-6. ^ Bitner, M.J. (1992). "Servicescapes: The impact of physical surroundings on customers and employees". The Journal of Marketing. 56 (2): 57–71. doi: 10.1177/002224299205600205. JSTOR 1252042. ^ Babin, Barry J.; Darden, William R.; Griffin, Mitch (1994). "Work and/or Fun: Measuring Hedonic and Utilitarian Shopping Value". Journal of Consumer Research. 20 (4): 644. doi: 10.1086/209376. ^ Mishra, Anubhav A. (2015). "Consumer innovativeness and consumer decision styles: A confirmatory and segmentation analysis". The International Review of Retail, Distribution and Consumer Research. 25: 35–54. doi: 10.1080/09593969.2014.911199.